We are still trying to fully understand the extent of the damage caused by the Deepwater Horizon oil spill five years ago, one of the worst environmental disasters in US history. Following the Macondo well explosion in the deep waters of the Gulf of Mexico, five million barrels of oil were spilled in the deep-sea. In an attempt to avoid spills reaching coastlines, BP and government agencies sprayed over two million liters of oil dispersants – chemicals that break oil into small droplets – at depth for the first time in these conditions. The impact of the oil spill was readily apparent on Gulf communities and the coastal and shallow ecosystems, yet the effects on deep-water communities beneath the surface, were less obvious. During the three-month period when oil was spewing from the wellhead, there was immediate concern over the large volumes of oil being released, and rightly so. This led to several cleanup approaches aimed to prevent oil slicks from forming and reaching the coast. 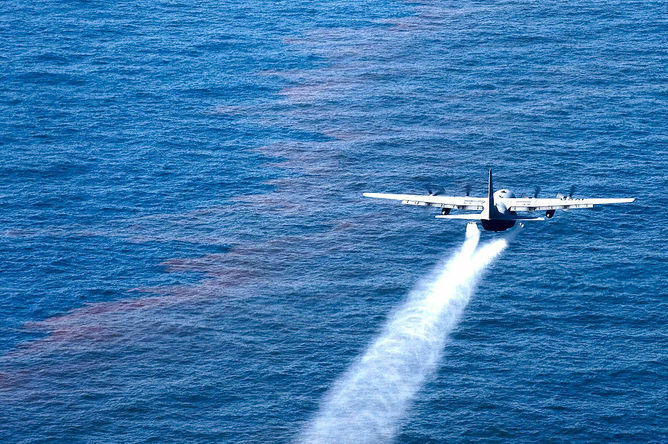 There was less attention and concern initially on injecting chemicals, notably dispersants including the product Corexit 9500A, into the deep sea without prior testing or knowledge of the consequences this action may cause. Within weeks of the initial explosion, for example, scientists detected giant deep-water oil plumes that persisted in the region. Dispersants have commonly been used in surface oil-spill cleanups. They help break down oil into smaller droplets that can then scatter throughout the water column. Prior to the Deepwater Horizon disaster, though, scientists and people in industry had never tested dispersants in deep waters under low-temperature, high-pressure conditions. Nor were their toxic effects tested on the coral communities that form the foundation of these ecosystems. Dispersing the dispersants in the Gulf of Mexico May 5, 2010. Adrian Cadiz, US Air Force public affairs. Cold-water corals, such as those found in the Gulf, provide habitat, feeding and nursery grounds for numerous marine organisms and commercially important fish. They are long-lived, slow-growing animals. This makes them more vulnerable to disturbances as it takes a long time – on the order of decades and or centuries – to return to a pre-disturbance state. In 2012, scientists located several spill-affected coral communities in the vicinity of the spill origin. Corals there were covered in a brown material containing Deepwater Horizon oil and traces of dispersants. Additional impact areas were later found. Whether this damage was caused by sinking oil particulates, dissolved oil, dispersants, or a combination of all of these sources was unclear. We set out to understand the impact on corals – important knowledge given the extent of current and planned oil drilling in the deep sea. To study existing and future spill effects, we first needed to test the toxicity of the oil and dispersant on these corals and uncover whether adding dispersants may have done more harm than good. Under the supervision of my advisor Erik Cordes at Temple University and in collaboration with Dannise Ruiz-Ramos and Iliana Baums from Pennsylvania State University, we conducted experiments on three different species of corals (Paramuricea type B3, Callogorgia delta and Leiopathes glaberrima) common to the deep waters of the Gulf of Mexico. Corals were collected with remotely operated vehicles and a series of short-term (96 hours) exposures were conducted shipboard. During this time we tested the effects of both dissolved and non-dissolved oil. We also tested dispersant and oil-dispersant mixtures to determine overall toxicity and responses to these pollutants. Paramuricea corals in the oil plus dispersant treatment. The vials (from left to right) contain corals at the 24, 48, and 72 hour time points, with the control sample on the far right. We photographed the corals and monitored them for signs of stress commonly observed in corals, such as retracting their feeding polyps, releasing mucous, dead tissue and bare skeleton. Corals were also assigned health ratings at each time point, with dead corals at zero and healthy corals at five. Ratings were primarily based on the percentage of the coral that was alive in addition to the above mentioned stress responses. Our recently published findings show all corals had more severe health declines in response to dispersant alone and the oil-dispersant mixtures than in the oil-only treatments. Corals exposed to higher concentrations of dispersant, alone or mixed with oil, had the greatest health declines. In some cases the corals even appeared to do best in the oil-only treatments. Although oil alone was not found to be lethal at the concentrations tested in the short term, we still need to investigate whether there is less obvious damage being done and if longer exposures elicit more of a response. We also observed that C. delta exhibited somewhat less severe health declines in response to oil and oil/dispersant, which may be explained by its habitat preference near natural oil seepage areas along the seafloor. 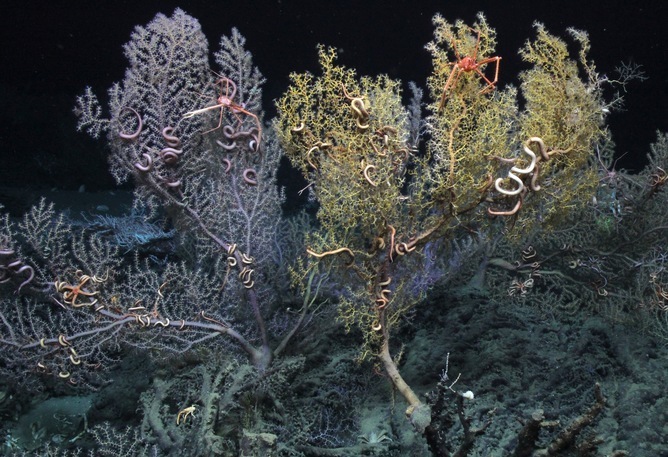 We believe exposure to the dispersant used during the Deepwater Horizon clean-up efforts may be more toxic to the corals than the crude oil initially released. Moreover, adding dispersant to oil will increase the concentration of oil in the surrounding water. That can then lead to higher, more toxic exposures of oil components upon contact with marine life. 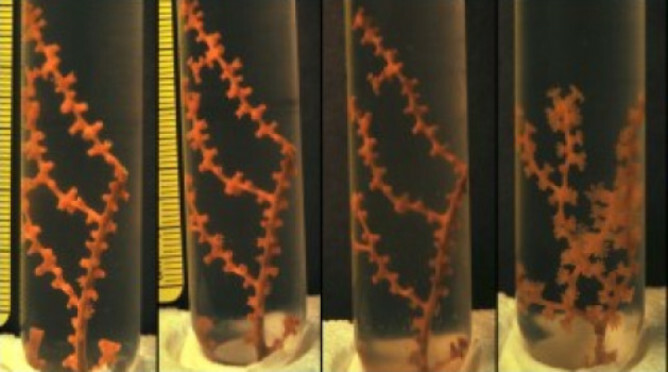 Although further testing needs to be done in an attempt to replicate Deepwater Horizon conditions at depth, our experiments provide evidence for the toxicity of both oil and dispersant on cold-water corals. This finding should be taken into consideration for remediation efforts in the event of future oil spills.